The new, hilarious yuri comedy! Hime gets roped into working at a weird café where the waitresses pretend to be students at an all-girl boarding school. She's strangely taken with her partner Mitsuki, who's so kind to her in front of the customers. There's just one problem... Mitsuki really can't stand her! At the café atop the hill, newcomer Hime looks up to her elegant coworker, Mitsuki, but their work partnership leaves much to be desired! Hime tries to maintain her perfect-girl façade, but after causing so many mishaps-- complete with spilled drinks and online rumors--Mitsuki finally sits her down for some real talk. Much to Hime's horror, it turns out that the two share a deep history, and this reality shakes Hime to her core. Now she can't seem to keep her head straight at work! Can she ever gain Mitsuki's trust...and is it all even worth it? 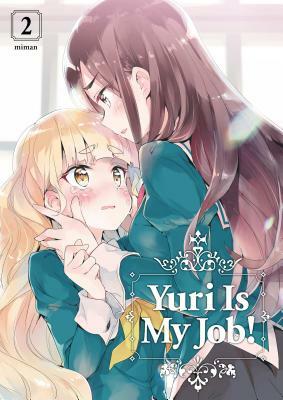 Miman had already been a popular contributor to yuri manga anthologies when her first series, Yuri Is My Job!, launched in 2016. It is also her first series to be translated into English. Series: Yuri Is My Job!